Crazy Necro Antics, Third Edition - Springtime! 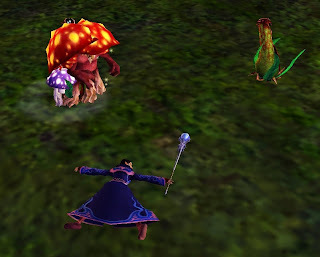 The necromancer is a playable character class in Everquest, also called necro for short. Necros have an ability called feign death--some nicknames for this ability are FD and flopping. 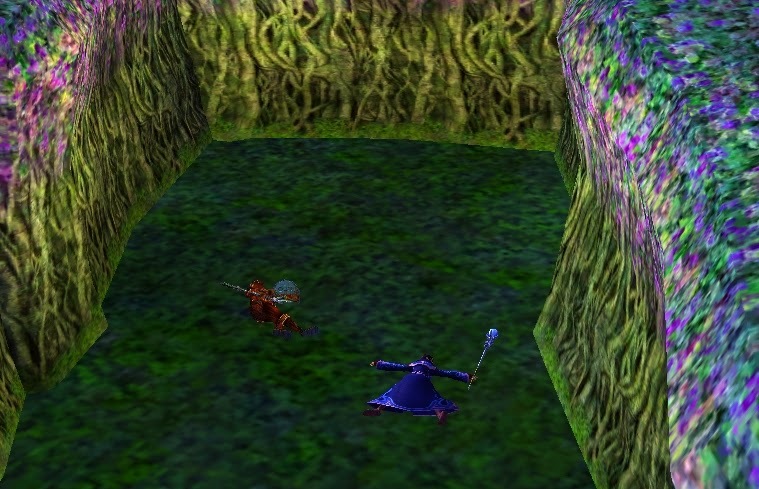 This series will highlight some funny instances of feign death. 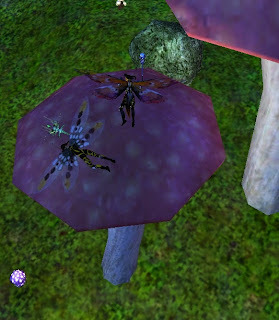 You do not need to be an Everquest player or even a gamer to laugh at these antics. Happy giggles! 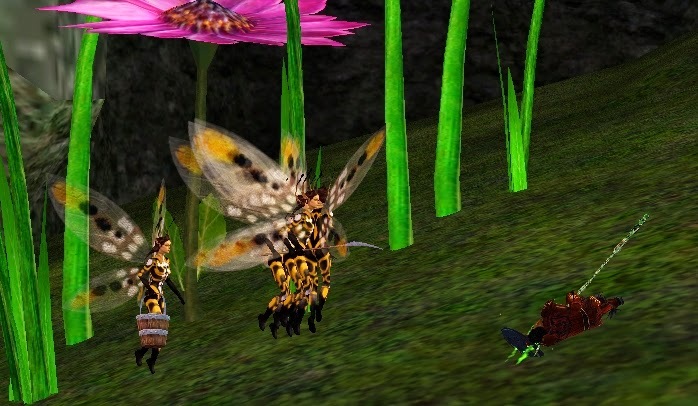 The bees (and bixies) are buzzing about, flowers are in bloom, and the necros make sure to enjoy spring as only necros can! 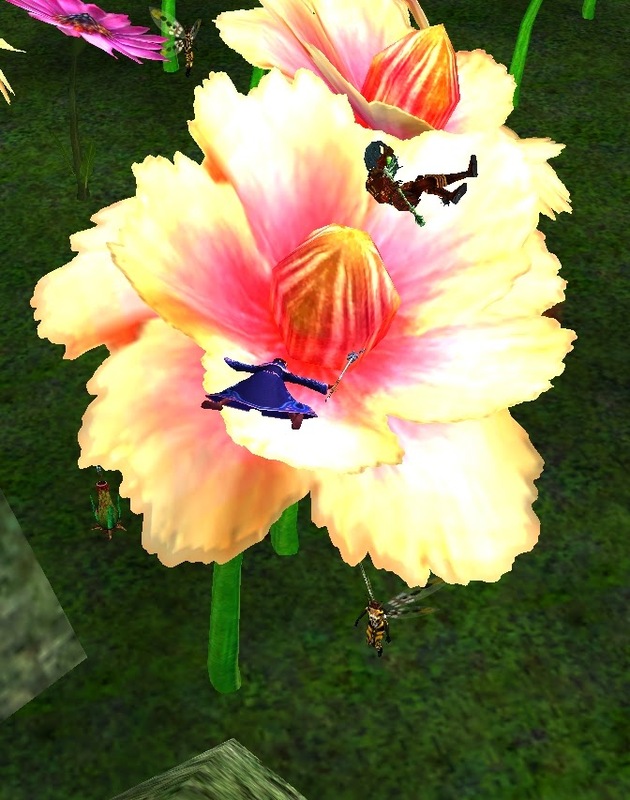 Morrigann decides that this time, fun amongst the flowers would be best had with a friend. So, Eteron joins her! As you can see, the heady scent of the flowers immediately puts them in a haze. They just can't stay on their feet, it's so intoxicating! Careful, Morrigann and Eteron, a bixie is lurking below--you may be dreaming spring dreams on her flower. Sure enough, the bixies are after Eteron! Oh, no. Play dead before they sting you. Where is Morrigann? She needs to come to her friend's rescue. Yikes! Guess she's in a pickle of her own. 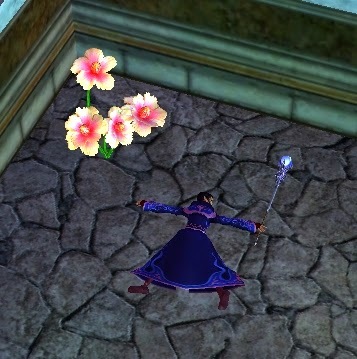 The sporelings and flowers must not have liked the way she smelled them. Seems the necros just can't stay out of trouble. 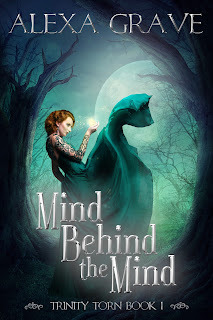 Can they escape without feign death becoming real death? Necro revenge! 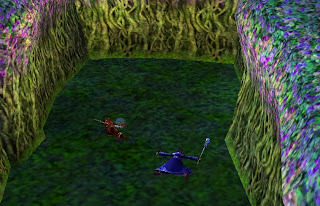 Both Eteron and Morrigann manage to smite the creatures camping them. And then they raise the dead for their own little army! Don't go threatening this pair of necros, or they'll put your corpse to work--no peace even in death! And if you can't beat them, join them. Morrigann and Eteron don bixie illusions so they won't be bothered by the locals anymore. 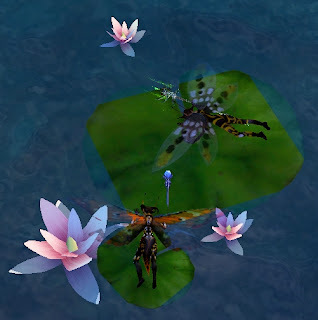 Oh, dear, guess the water lilies have them floating face down. They must not know bixies shouldn't go near the water. DON'T EAT THE MUSHROOMS! Oops. I guess it's too late. What are we going to do with these careless necros? I bet they're hallucinating now. Because you really shouldn't eat the mushrooms. Everyone knows that. Well, everyone except Morrigann and Eteron. 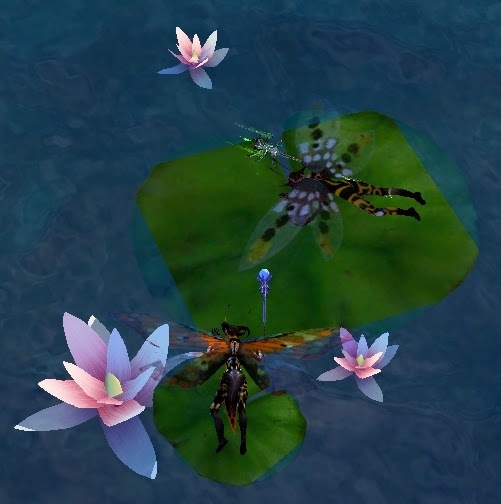 The day winds down, and the necro friends are exhausted from all of their spring frolicking. So exhausted, as a matter of fact, that they can't find their way out of the hedge maze. Oh, well. They'll just take a nap and worry about it later. 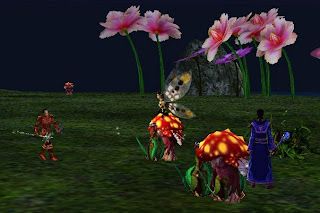 Morrigann wants to remember the fun time she had with Eteron, so she brings some flowers back to the guild hall. However, she had to fight several bixies off to be able to pick the flowers, so she's a little worse for wear. It was worth it, though! She can't wait until next spring. If you have any suggestions and silly antics you'd like to see, please post in the comments! It's possible your chosen antic(s) may be used in an upcoming post. All requests will be attributed in the post with a link back to the requester's blog (so include your blog link as well if I don't know it). Picture By SunOfErat Colors hold a lot of power in magic as well as symbolizing many things for us in everyday life. For this entry I chose the color green because spring is upon us (if winter ever gets the memo). How can you not think of green when the grass finally grows fresh and alive and the flowers start to bloom? Clearly green symbolizes nature, as referenced above, which in turn connects to fertility. Green is the color of life! But it's also the color of money, isn't it? Perhaps the U.S. paper money was made green because the color represents prosperity. If you look at the other side of the coin though, it also represents greed and jealousy. Don't let the green-eyed monster take over! Along with prosperity is also luck. The four-leaf clover, a long believed "lucky charm", is green. A few other things green is associated with are balance, harmony, healing, abundance, and health. What do you associate with the color green? If you'd like to read a bit more about this color, you can take a look at the following websites: The Color Green, Green Color Meanings, and The Meanings of Green. Cunningham, Scott. Earth Power. St. Paul: Llewellyn Publications, 1992.